Google on Monday responded to revelations that the latest Google Maps update is stripped of all Apple Watch support, saying it expects to return compatibility with Apple's wearable at some point in the future. Earlier today, AppleInsider reported Google quietly removed support for Apple Watch in the latest iteration of Google Maps released last month. The app's release notes did not convey the change to users, and Google remained mum on the subject until now. "We removed Apple Watch support from our latest iOS release, but expect to support it again in the future," a Google spokesperson told AppleInsider. 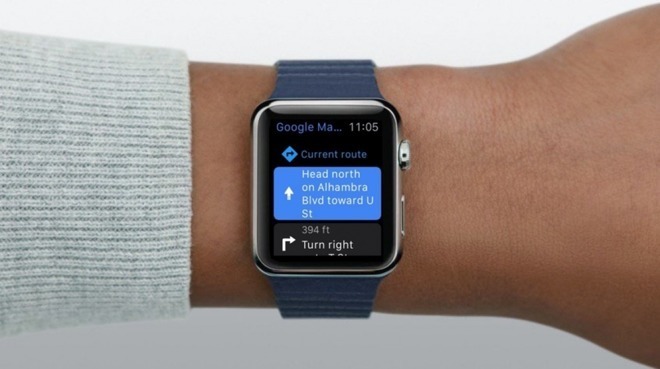 When, exactly, Apple Watch users can expect Google Maps integration is unclear. A basic iteration of its flagship iOS app, Google Maps for watchOS offered turn-by-turn driving, walking and transit directions for recently visited points of interest. Unlike Apple's first-party Maps solution, users were forced to conduct searches on a tethered iPhone. Google Maps for Apple Watch also lacked the ability to display a conventional map view, severely limiting its utility to end users. As indicated in today's report, Google's decision to pull its dedicated mapping app from watchOS appears to mirror app strategies from other major companies. Specifically, Amazon and eBay previously fielded titles for Apple's wearable, but removed those assets in recent updates. In most cases, the companies' app revisions are weeks old and the removal of watchOS functionality went largely unnoticed. This suggests the respective watchOS app versions were not widely used.